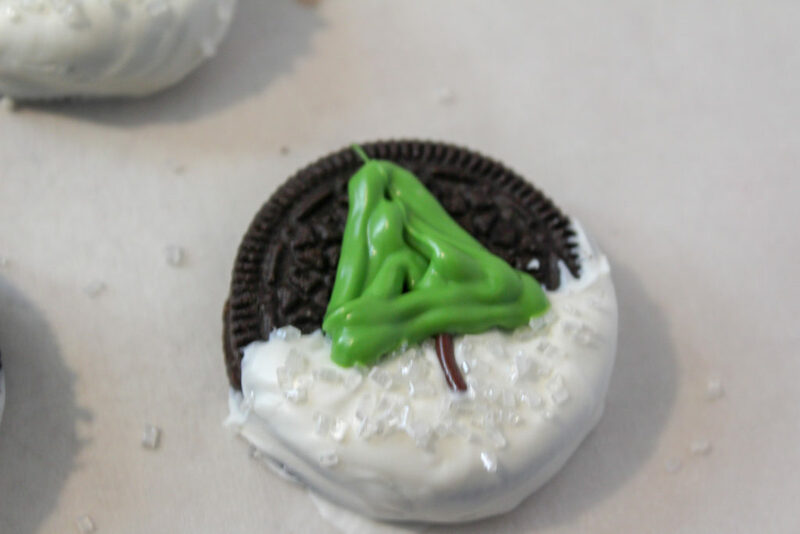 These Christmas Tree decorated Oreo cookies are super easy and fun to make and look great. 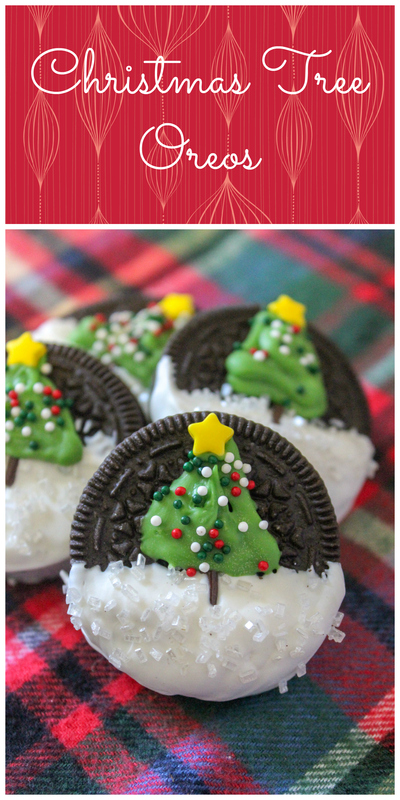 They are perfect for Holiday cookie exchanges! 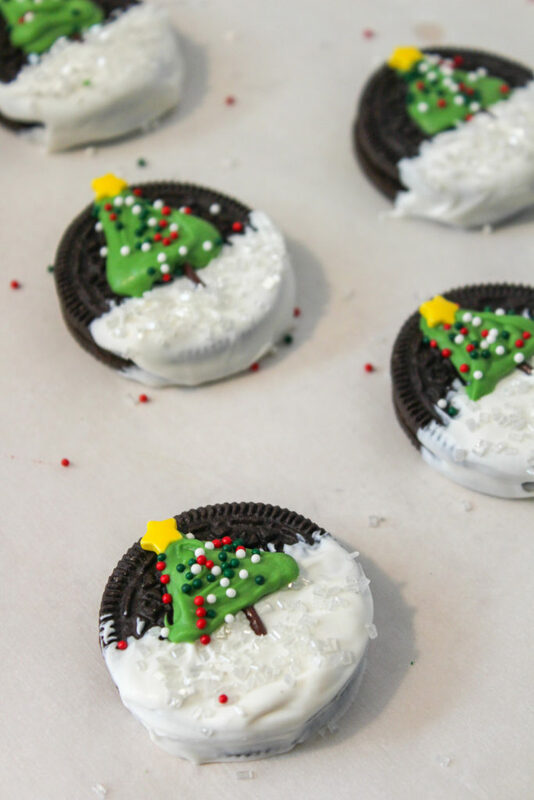 The ingredients are basically Oreos and whatever you want for decorating your cookies. Work on parchment paper to prevent the cookie and icing sticking to your counter. Melt the white candy melts according to the package instructions and dip the bottom half of each Oreo cookie into the white candy. 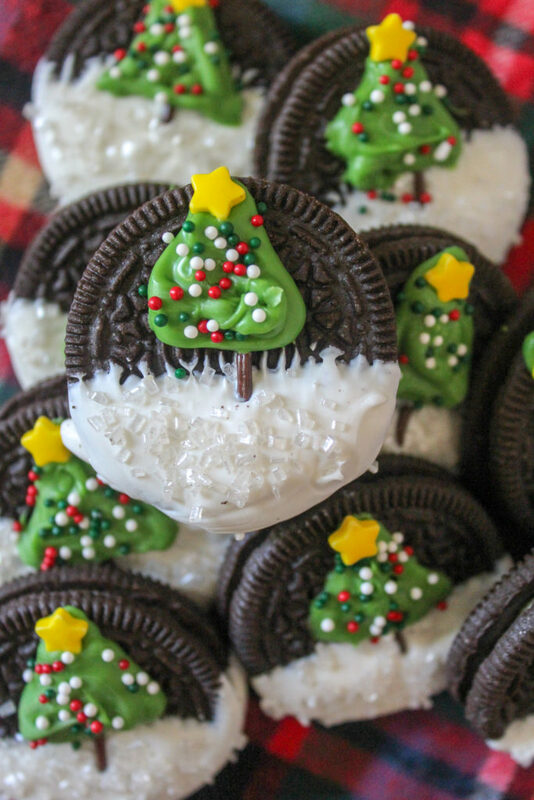 Sprinkle the Oreos with the with the white sugar crystals, place single brown chocolate sprinkles vertically for the tree trunks. 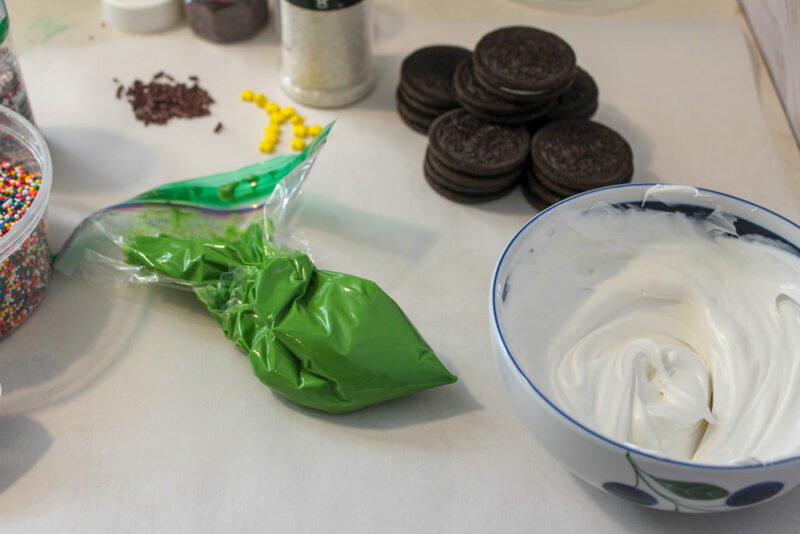 Melt the green candy melt according to package instructions, transfer to a ziploc bag and, after cutting a tiny whole in the corner of the bag, pipe a triangle tree on to each Oreo cookie. For ornaments, sprinkle with the Christmas sprinkles on the trees and then top with a star sprinkle/candy. Allow the cookies to to sit for a few minutes to set. 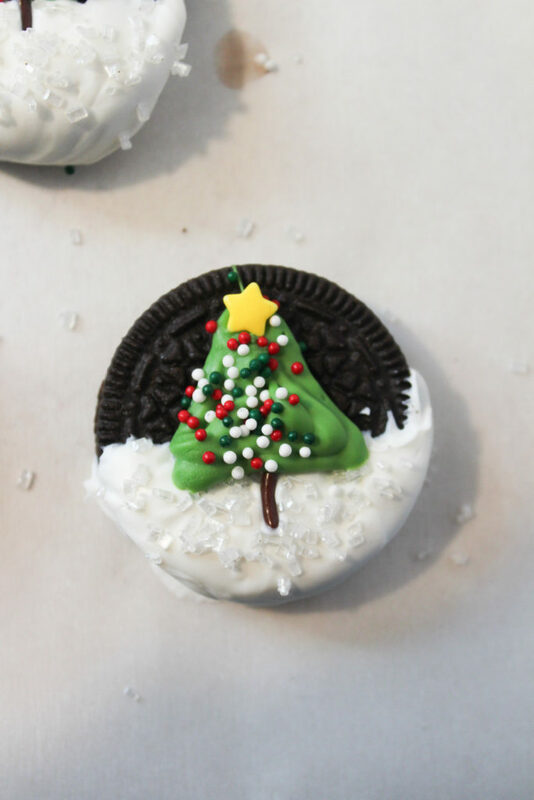 Then, arrange the Christmas Tree Oreo Cookies for display and enjoy! What I love about these cookies are how attractive they are, yet they are so quick and easy to make. 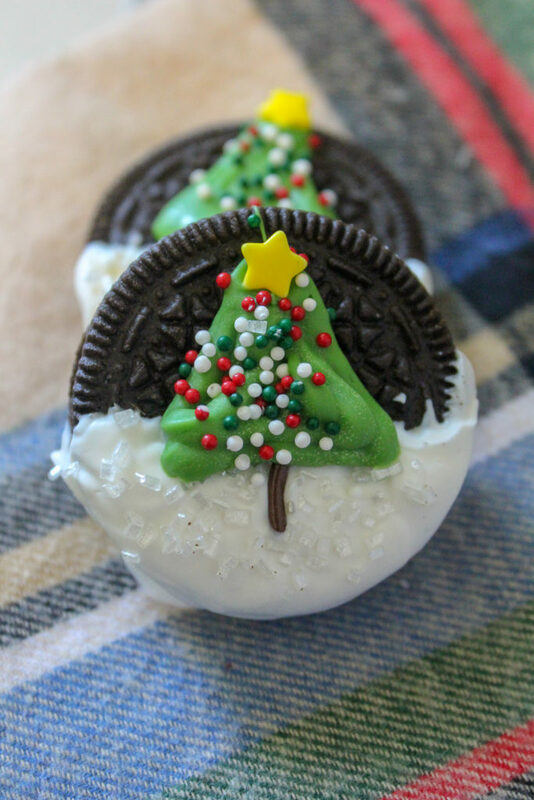 Quick and easy to make Christmas Tree decorated Oreo Cookies. Fun and tasty! Lay out a piece of parchment paper on your counter. 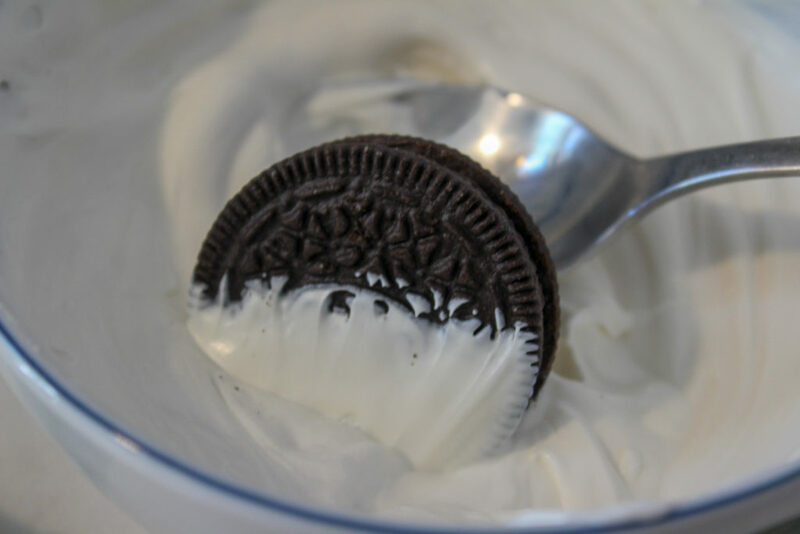 Dip the bottom half of an Oreo cookie into the white candy melts. Sprinkle with the white sugar crystals. Place a single brown/chocolate sprinkle vertical for the tree trunk. Melt the green candy melt according to package instructions. Once melted, transfer to a ziploc bag. Pipe a triangle tree on the Oreo cookie. Sprinkle with the Christmas sprinkles on the tree for the ornaments. Top with a star sprinkle/candy. Allow the cookies to sit for a few minutes to set. These are decadent and get a Devil icon!